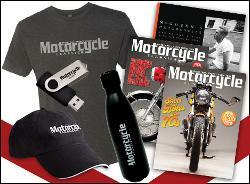 Prize: Motorcycle Classics Stainless Steel Water Bottle; Hat; T-Shirt; Street Bikes of the 60s Special Collector Edition; Street Bikes of the 70s Special Collector Edition; McQueen’s Motorcycles book ($118). Statistics: This contest was opened by 83 and entered by 5 ContestChest.com members. 6% of those who opened the contest, entered it.